Watchman Waterproofing is co-owned by Tim O’Brien, a military veteran and a fully credentialed builder who has been serving home owners in Massachusetts for many years. Tim formed Watchman Waterproofing to give homeowners and real estate professionals the opportunity to work with courteous and responsive experts in an otherwise under-served industry. After serving his customers, Tim spends his time on his boat and with his dog. David Kingsley, also an owner, designs our systems and schedules our installation crews. He has successfully designed and installed many systems under a variety of conditions, resulting in home owners reclaiming valuable space in their homes. Dave trains our crews in all aspects of waterproofing. He also emphasizes courtesy and cleanliness while our crew is in your home. Under Dave’s leadership, Watchman Waterproofing’s crews have received many laudatory comments from homeowners. Dave is also a dog enthusiast (there’s a pattern developing here). 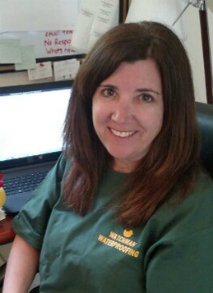 Kelly is our Queen Bee, running all financial aspects of the company. She is a wife and proud mother of 3, who loves to ski and help out the local lacrosse team in her spare time. Kelly is also an active fundraiser for diabetes research and advocacy for organizations such as JDRF and the ADA through walks, bike rides and other events throughout the year. Recently Kelly adopted her first dog, Peaches. After working in Watchman’s dog friendly office Kelly decided she needed a dog of her own. Julie is a recent graduate of Bridgewater State University (BA Strategic Communication), and our new Marketing Manager. She directs our digital communications and coordinates our marketing and education activities delivered to Home Inspectors and Real Estate Agencies amongst others. 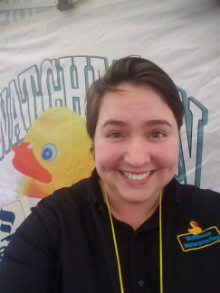 She is keeping Watchman Waterproofing on the leading edge of marketing and communication. Every year Julie walks in the Out of the Darkness Walk for the American Foundation for Suicide Prevention, she spends her free time fundraising for the walk. As the Mother of the office, Doreen keeps everyone in line and keeps the business running like a well-oiled machine. If you can’t find her in the office you will find her on one of the local ball fields watching her son play soccer, baseball or football. Not only is she a proud mother but she is also a proud dog mom. Doreen adopted Peaches sister Rosie. Rosie is a very adventurous pup who loves to steal sticks of butter! Larry is truly a jack of all trades. Not only has he designed basement waterproofing systems for over a decade but he is also the inventor of the Chubby Stove and a successful Real Estate Agent. When Larry is not busy working he loves to go on cruises with his wife. Mike is the newest to join our sales team, however he is not new to Basement Waterproofing. Mike has been designing basement waterproofing systems for over 20 years.